September 7, 2015. The days are getting a bit nippy, and some of the nights are downright cold. Clearly, autumn is just around the corner, much to my dismay. To enjoy the last dregs of summer, Matthew and I decided to hike through Tryvann — known as “Oslo’s Winter Park, where skiers can enjoy dozens of downhill runs and cross-country trails.” But even when there’s no snow, it’s still nice to amble along Tryvann’s pathways for postcard views of shimmering lakes and vast swaths of forest. 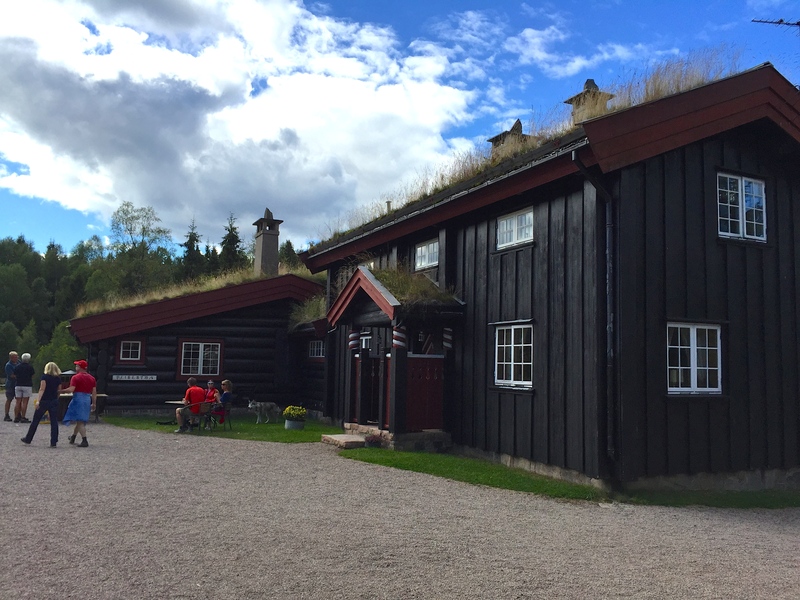 Built in 1931, Tryvannstua hosts visitors year-round, no matter the weather. 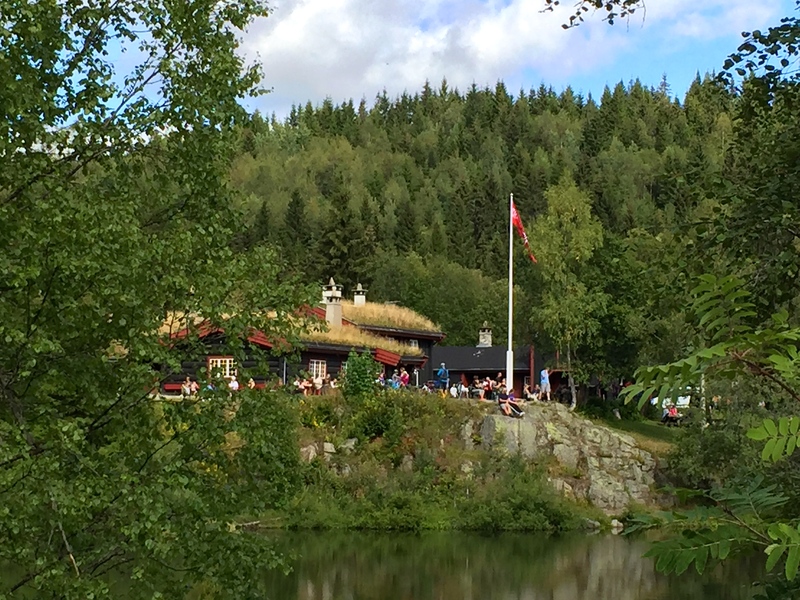 We jumped off the T-bane at the Voksenkollen stop with the idea of taking a short uphill stroll to the eatery, where we could then fortify ourselves for the downhill hike back home. But as usual, the signpost at the trailhead provided a confusing list of options. Three different markers labeled “Tryvannstua” pointed in three completely opposite directions, each with an estimated distance that differed by less than a half kilometer. Note the many confusing placards assigned to this post. Suggestions, anyone? 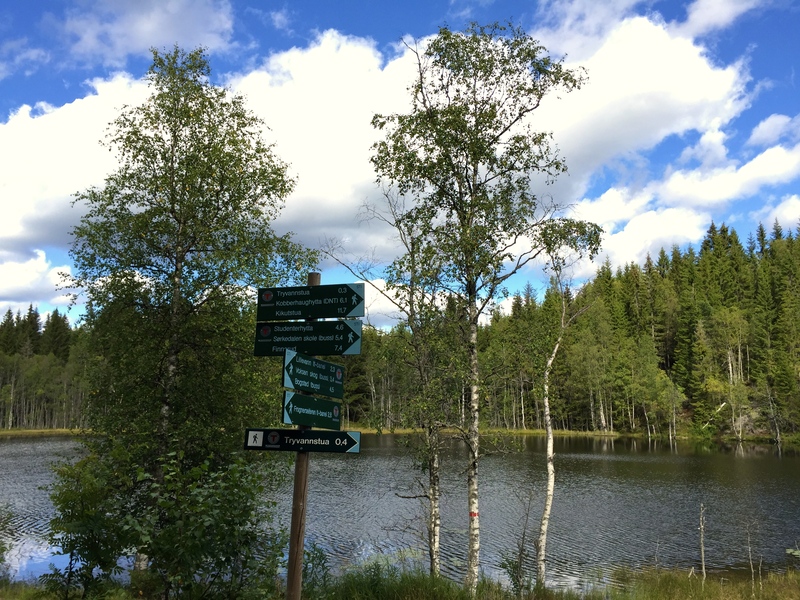 We decided to poll passing Norwegians for their recommendations, but everyone shrugged and suggested trails not marked on the bristling signpost. I felt a bit like I was in the middle of a Three Stooges movie, with Mo, Larry, and Curly each pointing up, down, and every which way. We finally selected the sign sporting the shortest distance and took off down the path. In retrospect, I wish we’d emphasized that we were looking for the most scenic route, because the trail we’d chosen turned out to be not so very picturesque. It looked as if a storm or some sort of blight had moved through, toppling or killing many of the trees so that they’d had to be chopped off right above the soil line. Hundreds of dead stumps studded the pathway’s shoulders, giving the hillsides a scarred, logging-camp vibe. The trees are so close that they seem to leave little room for error if a ski jumper flies off track. Eventually the wasteland gave way to a more forested section that somewhat surprisingly hosted an old wooden ski jump. The whole thing looked a bit rickety to me, but the signs made it clear that kids still use it for training. Not sure I’d want to take the leap and risk getting blown into the encroaching treeline and skewered by a pine, though. The trail itself continued along a steep pathway laced with gnarled tree roots that threatened to trip us with every step. Huge stones littered the path, making it look as if it had been paved for the giants said to roam these woods. Towering anthills and waist-high thickets of ferns gave the whole place a fairytale feel, and I could see how the atmosphere lent itself to legends of gnomes and trolls. My legs were shaking after rambling over this rough track for a half hour. This wood-ant nest is almost as tall as I am. Supposedly you can see all the way to Sweden if you have the guts to climb up to the T.V. 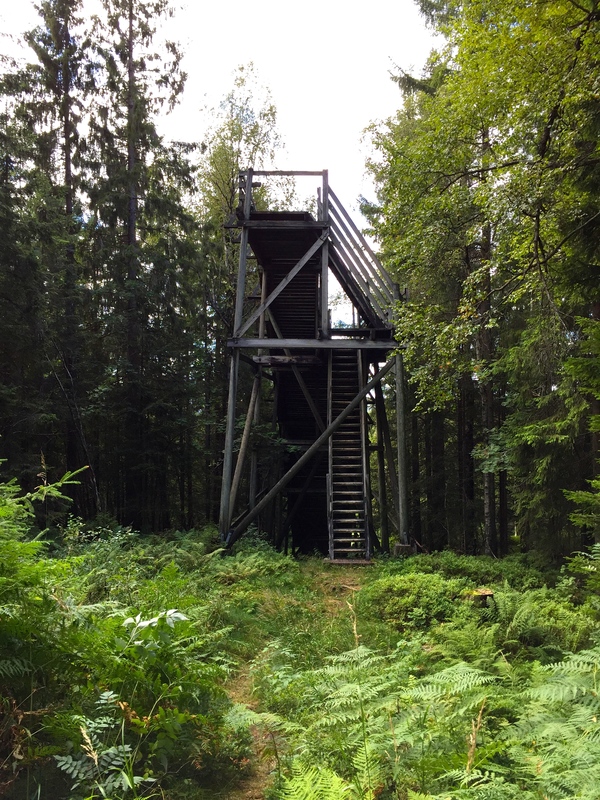 Tower’s viewing platform. Around a sharp bend, we stumbled into a wildflower-studded meadow buzzing with the efforts of giant bumblebees drowsily harvesting the year’s final crop of pollen. Snow cannons and an empty ski lift testified to the meadow’s origins as a winter ski path. A funky 1960’s TV antenna crowned the top of the hill and provided an excellent viewing platform for the panoramic woodland vista. Tryvannstua provides a perfect picnic spot on summer days, and a great warming house during winter. The original building, which was later expanded in the 1960s. Don’t you want to curl up here with a warm cup of coffee and a good book? Love the cool woodland swag. Wooden bears survey the dining room from their chandelier perches. I think this might be a partridge or grouse? Who doesn’t need a pair of rosemalling-covered skis? After a bracing cup of coffee, we took a stroll around the building to admire its traditional sod roof, ladened with wildflowers as well as ripening grain, blueberries, and raspberries. The path homeward took us through soggy wetlands decorated with colorful mushrooms and even more berry bushes, just as we’d hoped. Luckily, we’d asked the kitchen staff at Tryvannstua for a spare container in case we encountered such delicacies. We managed to collect a couple of pints of berries that we made into muffins as soon as we got home — one final taste of summer before winter hits. Note the red-ripe raspberries on the sod roof! Balancing on the boardwalk with my stash-o-berries. It’s worth the stains for the bounty. Yum — the fruits of our labor. Is it just me or are you two looking more and more norwegian in every post? Ah, if only…. But that would take growing another ten inches (for me, at least). You & Matthew are having some awesome adventures! I look forward to reading your posts–especially those with descriptions of the unusual yet yummy-sounding food. Do you have a recipe for the caraway drizzle you used on the root veggies last Christmas? Heat the oven to 400. Place the beets on one side of your roasting pan, and the parsnips and fennel on the other side (so they don’t turn red from the beet juice.) Drizzle all the veggies with the olive oil, then sprinkled them with the caraway seeds, salt and pepper. Stir them to spread the spices evenly, then roast them for 40-45 minutes, stirring once or twice, until they’re slightly browned and tender. Place them in a bowl and pour in the Caraway Drizzle (recipe below). Toss them until they’re well coated, then sprinkle them with a bit of sea salt when they’re done. Bring all of these to just boiling in a small saucepan, then pour them over the roasted veggies as described above. These are a great complement to herring or salmon, along with some rye bread. Enjoy!